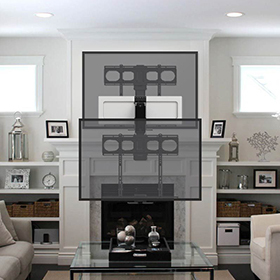 MantelMount not only offers tilt and swivel but also allows you to easily pull the TV down off the wall and position it in front of the fireplace at eye level. And you can just as easily push it right back up. Even better, MantelMount comes at a fraction of the cost. 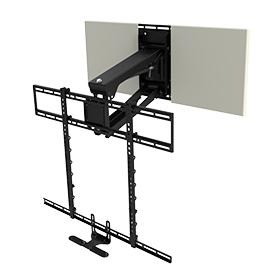 Other professional grade flat screen TV mounts that offer tilt, off-the-wall pull down and swivel can cost anywhere up to $900! TV Weight Capacity-20 to 90 lbs. TV Size Minimum- 44"-80". VESA Compatibility-Up to 725mm x 550mm. Winner of CEPro's "Best TV Mount", the MM700 Pro Series Mount is our top-of-the-line Pull Down TV Mount for the consumer who owns the finest of everything. TV Weight Capacity-30 to 115 lbs. TV Size Minimum-45"-90". VESA Compatibility-Up to 800mm x 550mm.